So, take this with a grain of salt as you would any other sourced report, but it jibes with public comments from both players as well as common sense: ESPN claims that a big reason Dwight Howard left the Lakers was because he didn't want to play with Kobe Bryant for another five years. The wording is tricky, and important. The ESPN report says Howard and his agent "strongly suggested the center would have a difficult time re-signing with the team if Bryant stayed with the franchise beyond the 2013-14 season, the final year of his contract." We can take this to mean that Howard wants a team of his own, where he has to play second banana to no one. Or we can take it as Howard believing he has a better shot to win a title on a team that isn't devoting a big portion of its cap space to a player in his mid-30s—and Kobe says he has no intention of taking a pay cut. Yesterday, Bryant spoke publicly for the first time since Howard committed to Houston. At his annual youth basketball camp, Kobe seemed to signal that it was an issue of being the team's top dog. "I think everybody is cut differently," Bryant said. "[Howard] has his way of leading that he feels like would be most effective and would work for him, and obviously the way we've gone about it with this organization and the leaders that we've had—myself, Magic and Kareem—we've done it a different way." The rub is that Howard probably won't be The Man in Houston; he's spent too many years gaining a reputation as a mercenary and a coach-killer for that. The Rockets' resurgence began with James Harden, a perfectly likable and marketable face of the franchise who's closer to a court general than Howard will ever be. But it's not a stretch to assume the Rockets wooed Howard by promising him a leadership role—for their free agency meeting with him, they trotted out a series of former big men who had earned the marquee. What then, to make of Howard reportedly asking Houston management to corral its own Big Three? 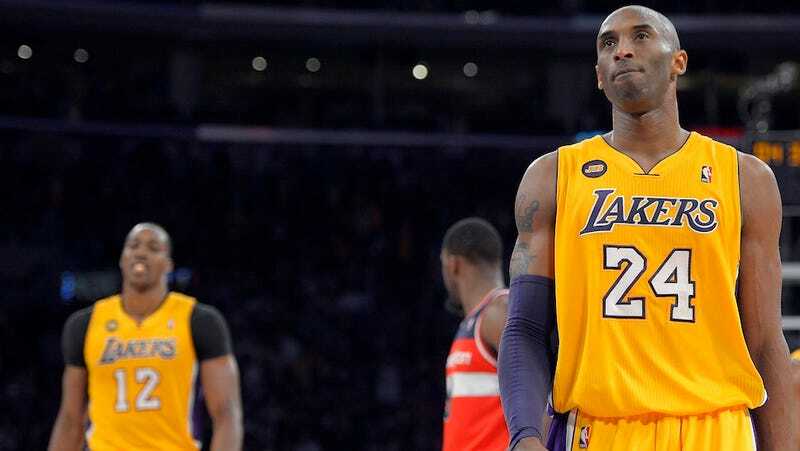 For his part, Howard gave comments last Friday that don't require much deconstruction to find his thoughts on the current state of Kobe Bryant. "I just really think the timing in L.A., it wasn't right for me. Maybe two years ago, or 2-3 years from now, it would have been the right time. But I just think right now the timing was off for me. That's not saying that L.A. is a bad place, but I just think it's all about timing and fit when you're talking about basketball. You can put anybody together on the court and expect them to win, but the pieces have to really fit in order for a team to be successful and it was very, very tough, man." Two years ago, Bryant was still a game-changing megastar. Two years from now, he might be gone, his cap space given to a LeBron or a Carmelo. But if, as reported, the Lakers wouldn't make any guarantees about their future plans for Bryant—who's earned the right to play in L.A. past peak effectiveness—then it's hard to blame Howard for choosing a more complete team. Yesterday, Bryant played down Howard's decision to leave, saying he won't "waste my time trying to figure out why that happened." And of unfollowing Howard on Twitter as soon as the news broke? "I have a hard time following people that want to beat us. Not to say that we're not friends or I don't respect him or anything like that." Translation: Kobe has circled Rockets games on his calendar, and will do so for the next half-decade.